Welcome to Happenings, where you will learn what Rachel has been up to this week. Check back every week for Finished Items, Works-in-Progress, Reading, Watching, and Hearing. You will also find happenings from other crafters that caught her attention. Not knitting, but related. Inspired by Craftsy's Drawstring Bag free class, This bag was cut out and sewn in one afternoon. It is the perfect size for a pair of socks, or I might use it occasionally to keep a wound ball neat. There is also a Craftsy Class Bag Making Basic's Reversible Tote and Zipper Pouch. I plan to make the tote with a drawstring as well. And the zippered pouch would be great for knitting notions. My new reversible project bag. Isn't it cute? A vest for Interlacements Yarn in Rick-Rack. The colorway is Scottich Lichen. After rigorous testing, Sarah's Shawl has been released. The yarn in this model is Interlacement's Vixen, Turquiose colorway. Such a great color, what do you think? 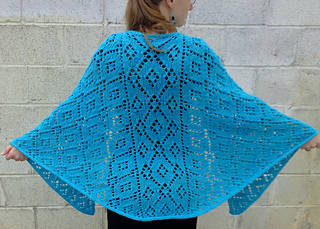 More details about the release at Release: Sarah's Shawl. You have until July 31, 2015 to get 25% off. Calligraphy, Crochet, Drawing, Knitting, Sewing, Woodwork are just some of the catagories at the Antique Pattern Library. Public Domain works, scanned and waiting to be discovered. Knitty found a pattern special enough to break there only knitting rule. Swink! is a sweater that works like an accessory. Follow the directions to make one just your size. Finished Socks, Chain Maille, Giveaway, a new pattern to check out. This blog post contains affliate links to Amazon.com and Craftsy.com For more affiliate links, visit the Affiliate Links Page.